We were founded on an airfield in 1959, in the village of Haddenham, and from our early days, our drive has always been to develop technically perfect, visibly striking products that are part of a system. Our first product was the world’s first plastic hose connector – the Hoze – Lock. Today, our head office is in Birmingham (UK), and although we are a global garden equipment manufacturer, over 75% of our products are made in Britain. With the remaining 25% built in our overseas factories in France, Malaysia, Taiwan, and China. Hozelock is part of the Hozelock Group. 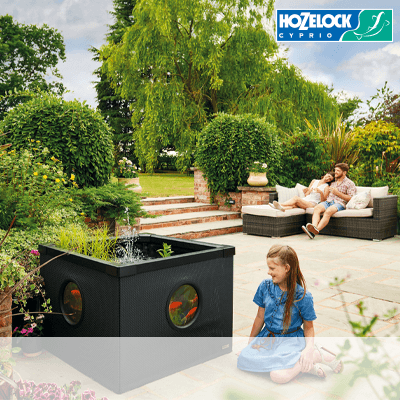 Hozelock – our retail gardening brand. Tricoflex – our B2B industrial hose brand. The sprinkler and fitting range had grown and Hozelock acquired the tools and worldwide rights for Green Queen all metal oscillators from America. Range expansion, particularly in sprinklers and hose end units resulted in excellent sales growth helped by several exceptional seasons. Hozelock purchased Associated Sprayers PLC with well-known brand names such as Killaspray and Polyspray, to expand the product range logically into sprayers. The company named changed to Hozelock – ASL. Hozelock won the coveted Queen’s Award for Export Achievement. Hozelock purchased hose manufacturer, Salford Plastics. Hozelock purchased rotary dryer manufacturer, John Brian. Award – Hozelock’s Micro Irrigation System won the ‘New Product of the Year’ award. Expansion – A new 28,000 sq. ft. hi-tech factory opened in Aylesbury, specialising in Injection Moulding. Accreditation – Hozelock was accredited BS5750 Part II Quality Standards. Launch – Super Tricoflex: the first PVC foam hose. Factory Development – Work begins on a new £8.5m 175,000 sq. ft. factory development in Birmingham to be opened in 1994. Hozelock Group PLC – Hozelock is floated on the London Stock Exchange where the company is valued at £60m. Factory Development – New state of the art Factory opens at Midpoint Park, Birmingham. Acquisition – Hozelock Holland BV is formed following the acquisition of the company’s Dutch distributor, Louis Blok Tuin BV. Anniversary – The company celebrates its 35th Anniversary. Factory Development – The Official opening of the Factory at Midpoint park is performed by HRH the Duke of Kent. Acquisition – Hozelock Sweden AB is formed following the acquisition of the company’s long term Swedish distributor J. Nordell AB. Registration – Hozelock achieved registration under BS EN ISO 9002 for all manufacturing, distribution and head office functions. Hozelock wins the Time ‘PLC of the Year’ award. Launch – The launch of the Aqua Control AC1 water timer takes Hozelock into electronics. Acquisition – Hozelock acquires Cyprio Ltd, market leader in filters, UVCs, and filter pumps. The acquisition strengthens Hozelock position in the aquatics market and sees sales of aquatics products reach £9.5m. Subsidiary – Hozelock creates Hozelock Denmark, the company’s fourth international subsidiary company. 1998 - First Wall Mounted reel with auto retraction. Acquisition – Major acquisition of leading European hose manufacturer, Tricoflex based in Paris, with over 200 employees and annual turnover of £20m in consumer, technical and industrial hose. • Design Council ‘Best of British’ Millennium Choice. • Gardening Which? Best Buy. • Garden Industry Manufacturers’ Association Best New Product. • Garden Industry Manufacturers’ Association Sword of Excellence. • Amateur Gardening Golden Trowel. • DIY Week Garden Product of the Year. Acquisition – Hozelock acquire another plant in Aylesbury –the Hozelock Design Centre –with a first-year investment of £1.5 m. the Smeaton Close site houses the expanding Design Team and additional Injection Moulding machines. TV – Hozelock’s first ever TV advertising campaign –for the Auto Reel. 2004 - Soft touch, locking trigger and flow control. Movement – Haddenham closes. Head Office is relocated to Aylesbury. The Distribution Centre extension is completed and fully operational at Midpoint Park in Birmingham. Product – 360° sprinkler 2 in 1 function. Relocation – The Mould shop is relocated from Aylesbury to Midpoint Park, Birmingham. Award – Winners of the MX award for Business Development and Change Management. Relocation – Hozelock relocates all of its operations to Midpoint Park, Birmingham Factory. Haddenham and Aylesbury close. Won MX Award for Customer Focus. Product – Premium connector, anti-kink, flexible sleeve. Award – Won the Institute of Mechanical Engineers: Manufacturing Excellence Award (MX) for Logistics and Resource Efficiency. Product – New range; simple and comfortable to use. Acquisition – Exel Industries purchased Hozelock October 2012. RoSPA – RoSPA Gold Award. 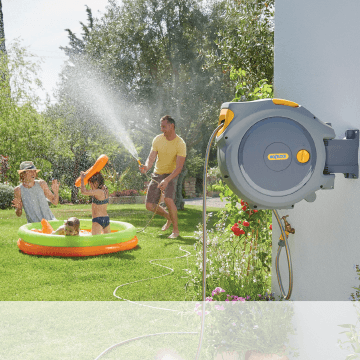 Product – Flexible spray lance and sprinkler. Product of the Year – Hozelock product ‘The Flexi spray’ crowned ‘Product of the Year 2013’ at the Prestigious RHS Chelsea Flower Show. Ultra compact reel for small gardens – Finalist (Shortlist) for Product of the Year 2014 at the Prestigious RHS Chelsea Flower Show for The Pico Reel. Finalist – Hozelock is a Finalist in the Insider made in the Midlands Awards for its contribution to Manufacturing in the region. Product – 2 in 1 Spray Gun and Sprinkler launched. Product – Mobile app that controls your garden watering launched. 2017 - New and improved and still the best auto reel. Product – Soft touch connectors for added grip and comfort. Award – Inspiring Wellbeing Award for the Workplace. 2019 - The innovative Biomix for preparing natural garden solutions. Founded on an airfield in 1959, in the village of Haddenham, from our early days, our drive has always been to develop technically perfect, visibly striking products that are part of a system. Our first product was the world’s first plastic hose connector – the Hoze-Lock. Today, we are a global garden equipment manufacturer with our head office in Birmingham (UK). Over 75% of our products are made in Britain. With the remaining 25% built in our overseas factories in France, Malaysia, Taiwan, and China. Hozelock is sold in Europe, Australia and New Zealand, where it is achieving rapid growth. We combine a knowledge and passion for gardening with a pride in craftsmanship to develop gardening solutions that help gardens flourish and come to life. Created by Gardeners for Gardeners. Being hands on in the garden can be very rewarding. Whether it is through watering or planting seeds in the flowerbed, our customers enjoy being part of its growth. With 60 years of horticultural expertise. 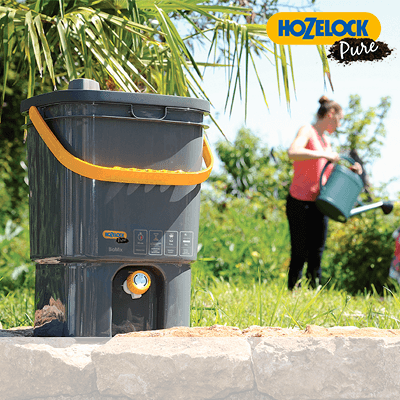 Hozelock understands the rewards of gardening and have developed the range to help gardeners get the most from their involvement. Every product is crafted to work time after time, so that our customers can care for their gardens in the best possible way. 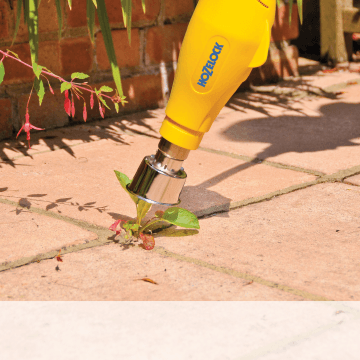 As a result, Hozelock is one of Britain’s favourite gardening suppliers. 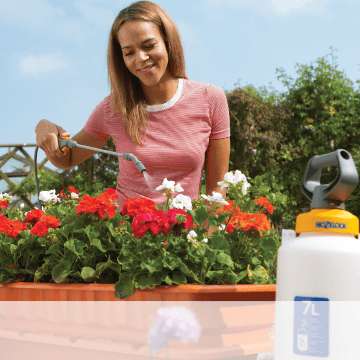 We continually invest into keeping our product range up to date, and we have a comprehensive range that covers garden watering, garden spraying, plant protection & pond solutions. • Customer satisfaction mirrors our performance. • Excellent service to our customers is the basis of a long lasting relationship and development of our group. • Satisfying the customer beyond their expectations will enable our group to exceed our goals. • We must always be more innovative than our competitors. • Innovating means bringing our customers new answers that serve real, but sometimes unspoken needs. • There is no limit to developing our products towards better performance and competitiveness. • Professionalism consists of respecting the set method and controlling the implementation of action plans. • Always look for and use the simplest solution. • Aiming at excellence means always striving to improve our processes, in order to add value to the group. • Doing what must be done and not only what I feel like doing. • Transparency requires honesty in all of our relationships. • Being transparent means telling each other everything in relation to my work, and accepting to listen to everything in respect of my colleagues. • Management communication is a duty that makes each employee understand their contribution to the group and its environment. • Each employee is encouraged to take the initiative in quickly responding to urgent matters. • Initiative is required, mistakes are allowed. • Trust does not exclude control. • The interests of the group matter more than individual goals. • Showing team spirit, means feeling responsible for the implementation of a joint decision. • The enemy is the problem, never the colleague. Fight the problem, not your colleague. • Each of us is our groups ambassador, internally as well as externally. • In our group, each and every person is valued and respected. • We work for a cleaner and better environment. • We comply with national & local demands concerning health, safety and work environments. • We are committed to continuous reduction of resources used in our company.